Alberto was born in Santo Domingo, Dominican Republic, while his family was living there, but grew up in Lima, Peru. He attended college in the U.S. and now works for a semiconductor manufacturing firm in Manchester,NH, where you can find him fishing the Merrimack River during lunch. His home waters are the rivers and ponds of northern Massachusetts and southern New Hampshire where he fishes for trout, bass, and panfish. 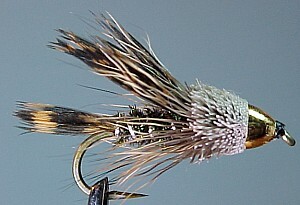 Alberto started fly fishing and fly tying in the year 2000. I had been looking forward all week to that Saturday. I had made plans to wake up early and head out to the Ashuelot river in western New Hampshire, have lunch riverside and fish until late in the afternoon. This was not to be. Thursday afternoon, while at work, my friend Matt, who lives in Houston, called. He was going to be in town for the weekend and wanted to get together and catch the afternoon Red Sox game on Saturday. This called for a quick change in plans. I no longer had Saturday free; I only had a few hours since I had to be in Boston by 3 p.m. to make the Sox game. Instead of driving out to the Ashuelot I decided to fish the Nashua river, which is about 10 miles from my house. Although the Nashua river is generally featureless (and best fished from a boat or canoe) as it makes its way through Nashua and Hollis, New Hampshire, there is one spot where it looks like a freestone river. This spot is relatively easy to wade and usually gives up some nice black bass and sunfish. That morning I woke up later than I wanted, about 9am, and shortly thereafter headed out to the river. I parked my car in the dirt parking lot next to the Route 111 bridge and headed down to the river. I started fishing the 2 pools just downstream of the bridge and caught a few sunfish and chubs. As I kept working my way downstream through the other riffles and runs I noticed the water was getting deeper so I switched to the Conehead Muddler this story is about. By this point, I had reached a pretty big rock jetty that splits the river in two. The canal of the left side is shallow and slow moving so I left it alone. The water on the right side is a different story. It has a small waterfall with a pool that has some nice structure for fish to live in. In this pool, the water rushes right up along the far bank of the river and then flattens out as the river gets deep. This area has always been productive for me as it holds some nice sunfish and an occasional 12"-14" black bass. On my 3rd or 4th cast with the Muddler I felt a strong thump on the line, set the hook and started to pressure the fish out of the fast water. As soon as I set the hook I knew this was a different kind of fish. The headshakes made it feel like a trout, but I knew this was considered a warm-water fishery and did not get stocked. I could see it flashing and thought it was a big chub. Once I got it to the slower water I got a good look at it, and lo and behold it was a nice, healthy 14" rainbow trout! I landed and released it and took another cast into the same area. Wham! Another rainbow, this one was smaller, perhaps 12". This one shook me off once I got it to the slow water. By this point it was almost 1:30pm and I had to pack up and put an end to what turned out to be a great day of fishing. The weather was great, the fish were hungry, and the two unexpected rainbows were just the icing on the cake. I relayed the story to my friend, Peter Frailey. He did some great detective work and found out the possible origin of these fish. By calling Steve Wheeler at the New Hampshire Fish and Game, he found that the downstream feeder brooks do get stocked, but only with brook trout. But about four miles upstream, in Massachusetts, the Nissitissett River dumps into the Nashua. This river does get stocked with rainbows (as well as browns and brookies). 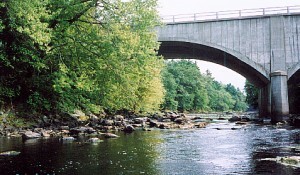 According to David S. Kaplan, author of "The Rivers of Middlesex County", during low water (absolutely the case during the summer of 2002), trout move downstream looking for deeper water, and are occasionally caught in the Nashua River close to the mouth of the Nissi. Both Peter and I believe that the two trout I caught somehow made it four miles downstream from the mouth of the Nissi, through sections of very slow moving water, countless bait fishermen, and finally settling into this little pool of fast, well oxygenated water. That was definitely a good day of fishing.